It’s the second time CourseGenius has been recognised by the business community this year - the first was when CEO Sarah Mateljan was named a winner at 2017 Business News 40Under40 in March. CourseGenius is an all-in-one online learning platform designed specifically for small and medium-sized businesses, which enables business users to easily develop and deliver bespoke, cost-effective eLearning courses that meet their businesses’ unique training needs. Sarah says their most recent recognition can be attributed to the company’s rapid growth since the beginning of 2017 and their commitment to continuing to grow their business into the future. “As a team of directors, we have been successfully growing businesses together since 2008, when we launched our first startup, LawCPD,” Sarah says. “As a result of our dedicated efforts in refining our product and growing our company, we have seen rapid growth in the past year in particular. In the past six months we have quadrupled our lead volume, halved our cost per lead and doubled our customer base. 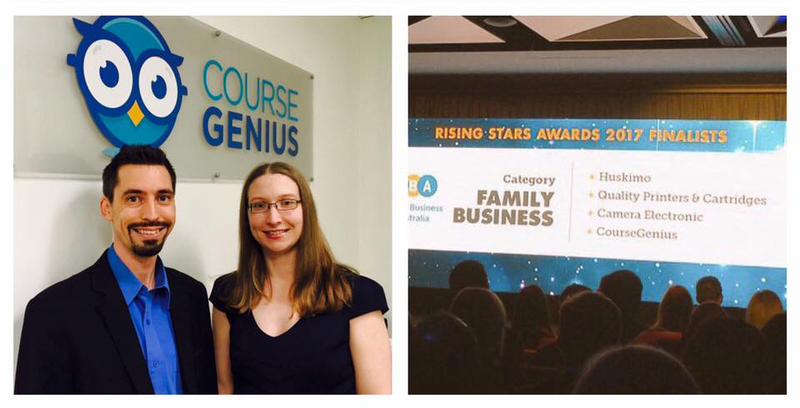 “Being being a finalist in Business News Rising Stars is recognition for the hard work and success our team has achieved in recent years. CourseGenius was founded in 2012 by Sarah, her husband Vince and friend Lee Goldsworthy. The company’s current growth and momentum stem from the Directors’ decision to expand the leadership team in 2013 and hire co-founder Vince Mateljan’s brother, Adrian, as Chief Technical Officer, off the back of a successful grant from Commercialisation Australia. This resulted in taking the development of the CourseGenius platform in-house and giving the leadership team complete control of the future of the company. Since founding CourseGenius, the Directors have been active in the community, both helping founders of startups by sharing their experiences and also assisting an international NGO with their online education programs. Sarah has spent time as a volunteer mentor at Founder Institute and has presented to the founders on a number of occasions. She is also a Springboard Alumni and she speaks at public events encouraging and supporting women in technology to participate in the program. As well as helping fellow startups, the CourseGenius directors are passionate about using online learning to expand the reach of education and have donated the use of the platform (and support) to an international NGO in Afghanistan. “The experience in Afghanistan taught me it’s possible to build something great even in incredibly difficult circumstances,” Sarah says.